You are invited to join over 200 professionals on Monday, June 3, 2019 at Central Connecticut State University as a business sponsor and/or exhibitor at the Connecticut League of History Organization’s Annual Conference. Your sponsorship and/or purchase of an Exhibitor Hall Table gives you face-to-face contact with those deeply involved in keeping history alive. Online Sponsorship Registration is OPEN! Our conference attracts nearly 250 individuals representing the museum and library community in Connecticut, Rhode Island, and Massachusetts. 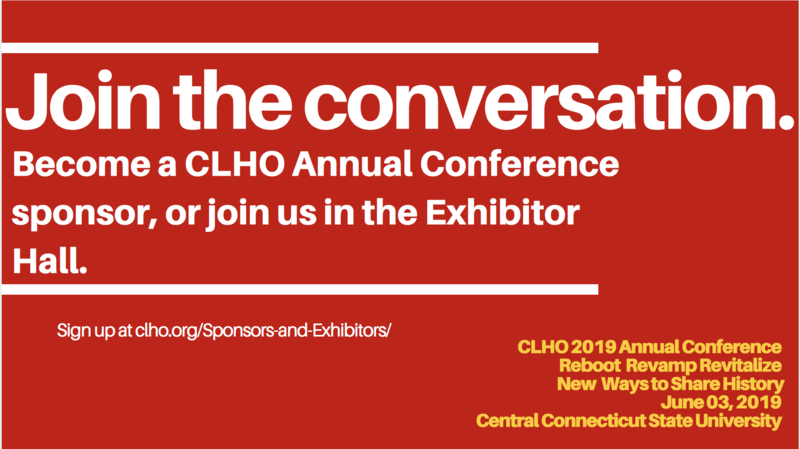 Sponsoring our conference is the most effective way to get your business noticed by CLHO’s constituency -- that's over 1100 potential customers working in the heritage field – and the collective purchasing power of the southern New England heritage community! Sponsorship & Exhibit Hall Deadline: May 10, 2019. Don't see a sponsorship of interest? Contact director@clho.org for other opportunities. Your organization's name on coffee break tables as "sponsor"
Your organization's name in Session Room and on conference program listed as "sponsor"
Includes table and chairs. Electricity is available. 9am to 4pm Constant contact with Conference Attendees! Become a sponsor at any level and your exhibitor table is absolutely free! For nearly 70 years, CLHO has strengthened and built connections among those who preserve and interpret the stories and objects of our past by sharing knowledge and expertise, and promoting best practices. Visit www.clho.org for updated conference information.